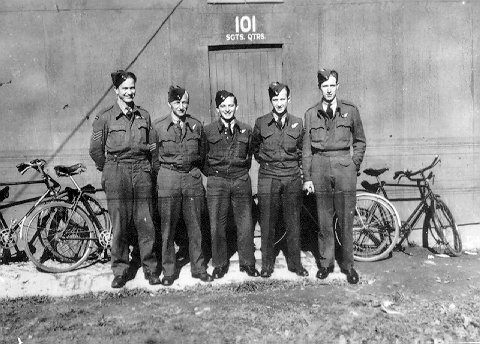 This site is dedicated to the men and women who served in the RCAF during World War Two. In particular we would like to dedicate it to F/Sgt. (N) John Kopchuk, R132169, who while serving with 429 squadron was reported MIA and later presumed KIA on 22 June 1943 while returning from a raid to Krefeld, Germany. The Wellington X bomber, HZ519, that he was a Navigator in was shot down in the sea off Holland by Maj. Kurt Holler. All 5 of the crew were killed. Three of the crew washed ashore in a dingy dead near Wemeldinge, Island of Zuid, Beveland, Holland. The cenotaph in F/Sgt. John Kopchuk's home town of Melville, Sask with his name on it. That's my daughter, Tatiana, and me. 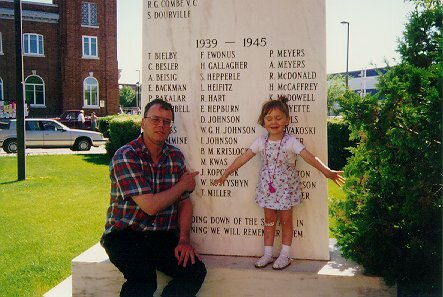 This was the first time I saw the cenotaph in the summer of 1997. My goal is to get photos of the cenotaphs for the other crew members on this site as well. 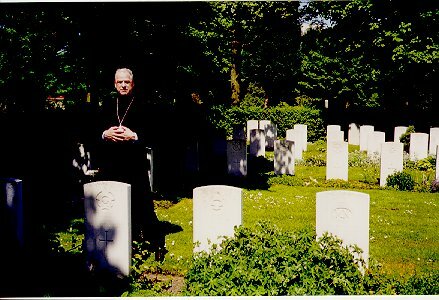 This is a picture of my father, Father Michael Kopchuk, standing by the grave of his brother F/Sgt John Kopchuk at the Northern Cemetery at Flushing (Vlissingen).My father is a priest in the Ukrainian Orthodox Church of Canada and blessed John's grave in the Orthodox tradition. This is the first time a Kopchuk has visited the grave. It was in the summer of 1999. Immediately to the left of John's grave is his good friend and fellow crew mate, F/Sgt O'Reilly. Two graves to the right of John is the 3rd crew member F/Sgt Orlinkski. Members of the O'Reilly family visited the cemetary this year. Maj. Kurt Holler reported downing a Wellington bomber at point #1 at 0118 hrs on 22 June 1943. The bodies of my uncle, O'Reilly and 1 other member (never positively identified) washed ashore at point #2 in a dingy on the morning of 22 Jun 43. 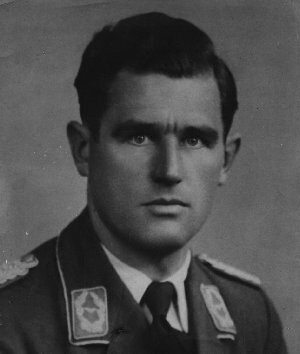 Orlinski washed ashore close to the same area on 26 Jun 43. Maj. Holler was also killed at 01.41 hours on 22 June 1943. His borkfunker, Robert Gotha, parachuted to safety and survived the war. Maj. Kurt Holler also killed in action 22 June 1943. Born 10 May 1911 in Tannenbergstal/Vogtland, Kreis Auerbach. He was awarded the DKiG on 4 Jun 43. He was wounded before on 21 Dec 1942. He crashed in his Bf 110E-2, werknummer 4488, 3C + AD, on the night of 22 Jun 1943 near Zierikzee . His Bordfunker Fw. Robert Gotha, baled out wounded. Maj. Holler is buried at the German military cemetery of Ysselsteyn/Netherlands. Maj. Holler had 19 shootdown victories. Maj. Holler & Fw. Gotha were serving in III/NJG4. Picture graciously provided via the efforts of Peter Spoden and Frau Gotha. 705 aircraft participated - 262 Lancasters, 209 Halifaxes, 117 Stirlings, 105 Wellingtons, 12 Mosquitos. 44 aircraft were lost - 9 Lancasters, 17 Halifaxes, 9 Stirlings, 9 Wellingtons - 6.2% of the force. This raid was carried out before the moon period was over and the heavy casualties were mostly causeed by night fighters. 12 of the aircraft lost were from the Pathfinders: 35 Squadron lost 6 of its 19 Halifaxes taking part in the raid. The raid took place in good visibility and the Pathfinders produced an almost perfect marking effort, ground-markers dropped by Oboe Mosquitos being well backed up by the Pathfinder heavies. 619 aircraft bombed these arkers, more than three quarters of them achieving bombing photographs within 3 miles of the centre of Krefeld. 2,306 tons of bombs were dropped. A large area of fire became established and this raged, out of control, for several hours. The whole centre of the city - approximately 47% of the built-up area - was burnt out. The total of 5,517 houses were destroyed, according to the Krefeld records, was the largest figure so far in the war. 1,056 people were killed and 4,550 were injured. 72,000 people lost their homes; 20,000 of these were billeted upon families in suburbs, 30,000 moved in with relatives or friends and 20,000 were evacuated to other towns. Minor Operatioins: 1 Mosquito to Hamborn, 15 OTU sorties. No losses.